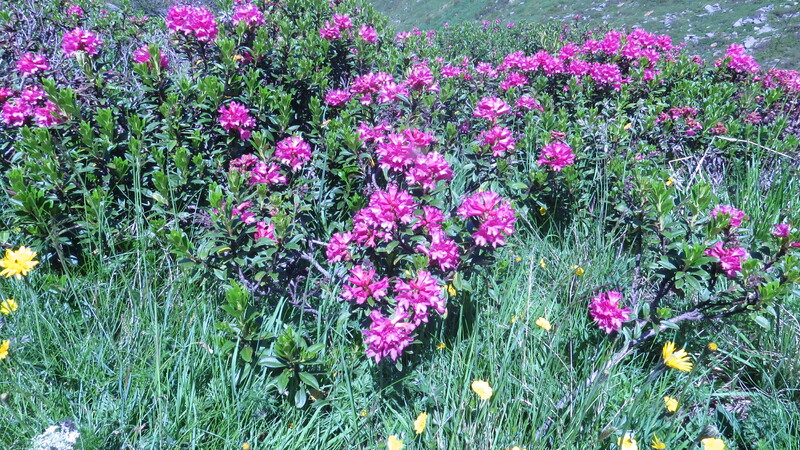 Dear Readers, there is one plant above all others that tells me that I am back in the Tyrol, and that is the Alpenrose. Some years, it’s already faded. Some years, it hasn’t really come into flower yet. 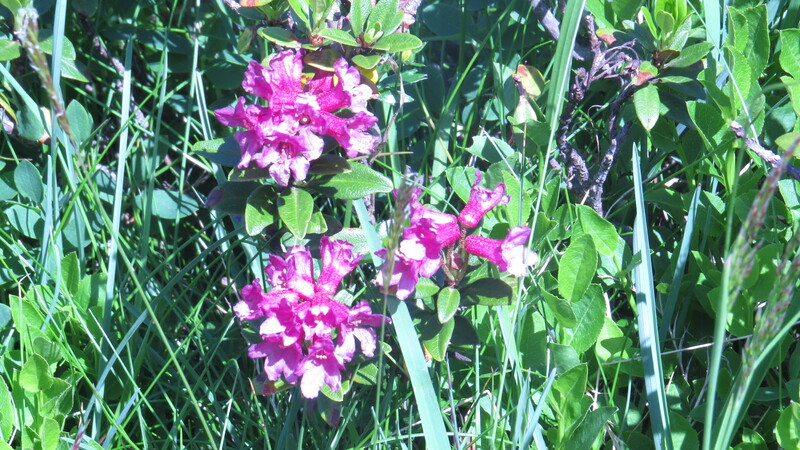 But this year, the hillsides and the forest are full of the cerise flowers. 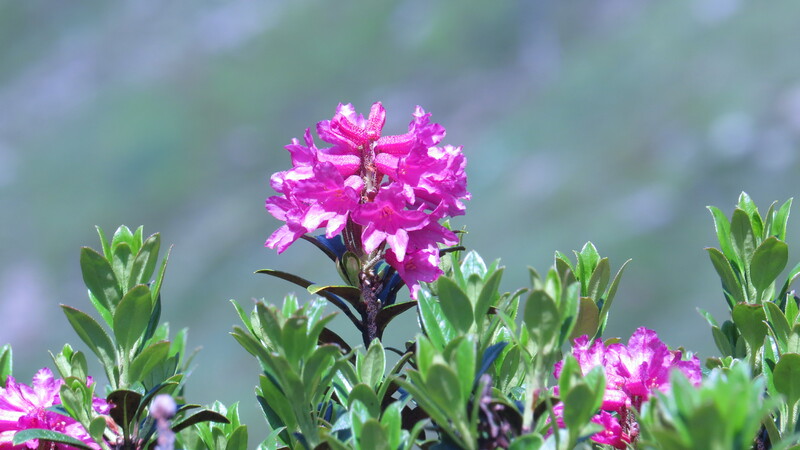 It is not a rose, as one glance at its flowers will tell you: it’s a Rhododendron. This was a surprise to me, as I always thought of this gaudy family as being something you’d find in Asia. But this is a plant that lives only in the mountainous regions of Europe, and only where there is acid soil. The underside of the leaves has iron-brown spots, which give it its species name. It only grows to a couple of feet high, and can carpet whole areas completely. However, it can’t cope where there is soil disturbance, so doesn’t encroach on to the pasture areas where the other plants thrive. 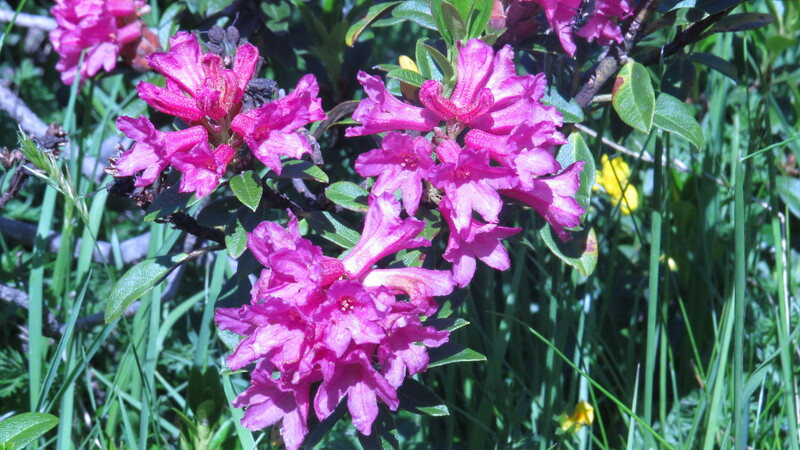 Although Alpenrose can set seed, and its flowers are loved by bees, it is especially adapted for the heavy snow conditions which will completely cover the plant in winter: the weight of the snow enables it to root from those branches which are pressed into the soil. It is also a very long-lived plant: one individual in the French Pyrenees has been estimated to be over 300 years old. Not bad for a plant living in such harsh conditions. 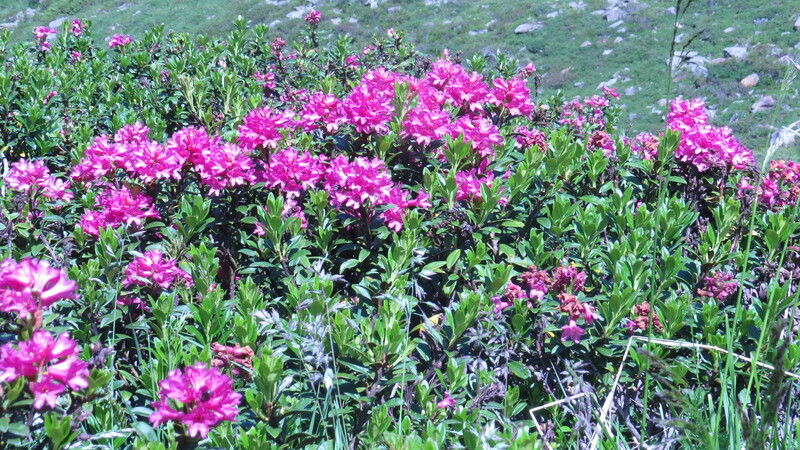 Alpenrose is poisonous, but has been used for many years in Alpine traditional medicine as a treatment for rheumatism. And as I huffed and puffed up the mountain trails today, I could well imagine how useful such a medicine might be for those whose whole way of life depended on being able to get up and down the kind of slopes that a Londoner doesn’t encounter. On the other hand, I see many people of advanced years cheerfully eschewing the chairlifts and the bus and walking through the pastures to collect their cows or their shopping, so maybe the message, as in so many things, is ‘use it or lose it’. And aren’t mountain people some of the most long-lived and healthiest in the world? Let’s never underestimate the value of day-to-day activity, of the kind that doesn’t necessarily involve a gym. This entry was posted in Bugwoman on Location on July 9, 2015 by Bug Woman. So even the plants live to a ripe old age too! Must be the alpine air!